A late 16th century house extensively rebuilt and remodelled by the architects Allason and Jekyll after a fire in the 19th century. The house was redesigned in the Gothick style and has battlements, buttresses, pinnacles and Gothick windows and doorways. A single storey hall was added to the west in 1840, and was built in Perpendicular style and was used for special social occasions. The house also has a conservatory, dating to about 1840, and a gazebo. The late 19th century stables have two octagonal gate turrets with inset Greek marble stelae dating to the 2nd century BC. Said to have Tudor core but exterior of 1852 in Tudor style. However rear and plan may be original. Now offices for Lotus Cars. In stable yard two important Roman tombstones from East Mediterranean, plaque of about 1670; other objects in grounds (see also NHER 14207). E. Rose (NAU) 6 January 1983. The house is listed Grade II, the walls with the tombstones II*, several other walls etc are Grade II, see (S2) for details. Architects plans (1996) in file. Gateway turrets and ranges, 1899, red brick, plain tiles. Octagonal 2-storeyed gate turret with projecting embattled parapet having double sawtooth brick cornice; recessed single segmental headed lights. Turret face with Greek stela relief marbles, late 2nd century BC. Forward attached single storeyed range with loft, crowstepped gables; 2 segmental headed carriage doorways, crow-stepped dormer above. The caryatids in the garden of Ketteringham Hall were discovered to be the originals from the Nelson Monument in Great Yarmouth. They were cast in 1819 in London, and were removed from the Nelson Monument in 1896. 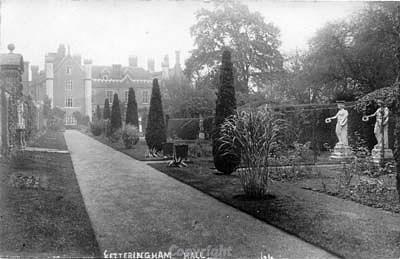 It appears that at this time they were acquired by the owner of Ketteringham Hall and put on display in the garden. For further information see correspondence and photographs (S3) from  in file and (S4). The hall was used as a headquarters for United State Army Air Force 2nd Division during World War Two. M. Dennis (NLA), 25 August 2006. --- Article in Serial: Sneff, R.. 1985. Drei Hellenistische Grabrelief in Ketteringhall Hall.. No 8. p 81-92. --- Monograph: Girouard, M.. 1978. Country Houses of Britain..
--- Monograph: Girouard, M.. 1980. Life in the English country house: a social and architectural history.. 2. --- Newspaper Article: 1998. Eastern Daily Press. 20 August. --- Newspaper Article: 1992. Eastern Daily Press. 5 February. --- Monograph: Michaelis, A.. 1882?. Ancient Marbles in Great Britain..
--- Archive: Clarke, R. R. and NCM Staff. 1933-1973. Norwich Castle Museum Record Card - Post-Medieval. Ketteringham. <S1> Correspondence: Various. 1983. Letters. <S3> Photograph: Parker, M.. 2006. Photographs of caryatids and headstops on Ketteringham Church. Digital. <S4> Newspaper Article: Eastern Daily Press. 2006. 5 May. pp 2-3. <S5> Website: 2nd Air Division Memorial Library. 2001. http://www.2ndair.org.uk/history.htm.